These last few days, I have been working on a new render—a green glass study. No big surprise there, as I'm a big fan of glass, refractions, reflections, caustics, dispersion, and anything related to rendering glass. There's something that just makes it never grow old. I used a photo I found on Facebook as reference, something I've been doing a lot recently. I find that real pictures taken by regular folks sometimes are more inspiring than perfect, professionally groomed pictures. Also, for those interested, I gave a different subtext to the whole composition. I renamed the bottles to 1714-2014, in honor of the recent political events in Catalonia. Catalans are trying to have a referendum on independence in 2014, which marks the 300th anniversary of Spain's invasion and occupation of Catalonia. My bottles are literally freedom-water bottles! Not a bad reason to drink to. As a side note, my blog has experienced a great increase in visits. As a way of saying thanks, I am including a link to the blend file and custom textures created by me. For the HDR image I use for the background, I would suggest using any that can easily be found online. Cheers! 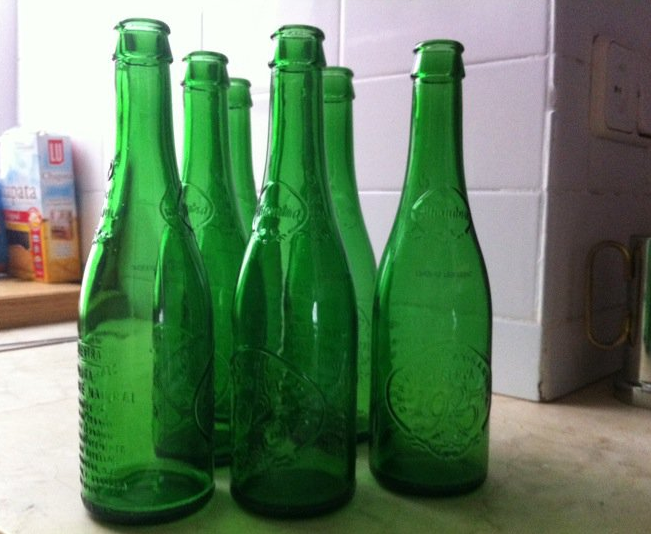 Green bottles. 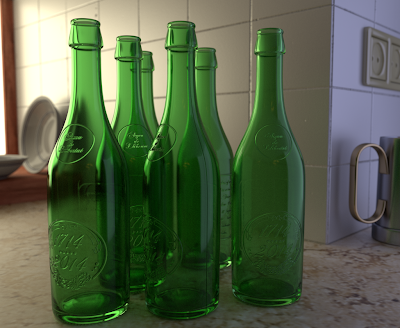 Rendered in Cycles, modeled in Blender. Thanks Andreu for sharing this blend. The raised logo on the glass is something I've been trying to do to SO long. Loving the blog. Keep up the good work, I'm learning so much. Thanks for the encouragement! It really means a lot.